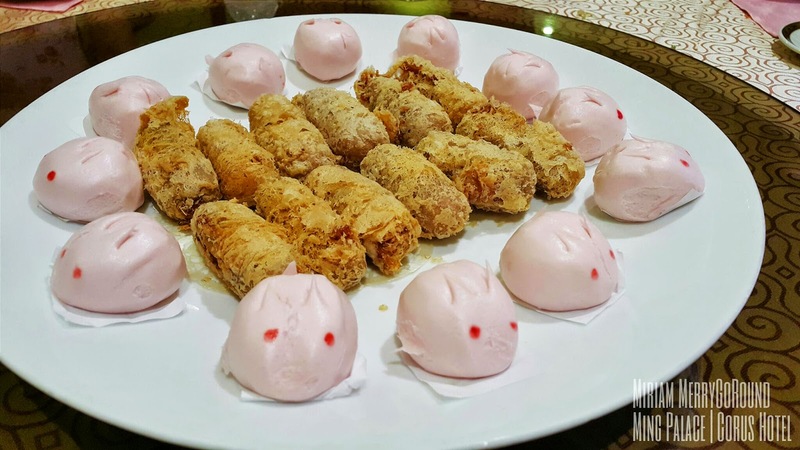 Chinese New Year is just around the corner and there are many places promoting their customised menu to usher in the Goat year. 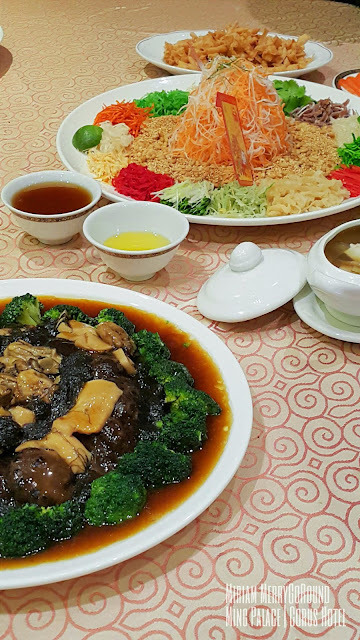 Thanks to Sidney I was able go savour the Chinese New Year menu at Ming Palace, Corus Hotel. If you are not familiar with Corus Hotel, it is actually at just a walking distance from KLCC and along the same road as Avenue K. You can either take the LRT and stop at KLCC or drive and park at their parking. 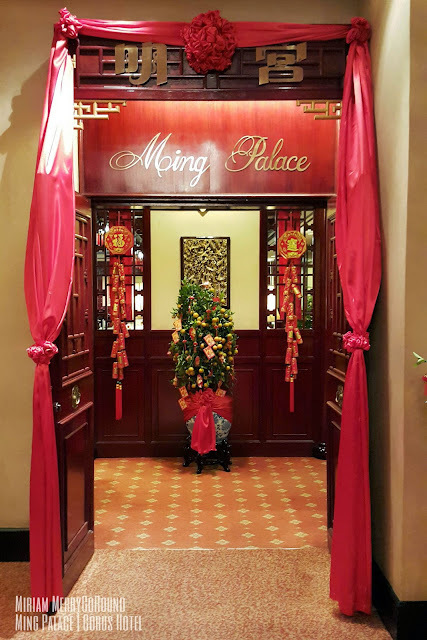 This Chinese New Year, Ming Palace has designed 4 auspicious reunion dinner packages to celebrate the new year with friends and family. 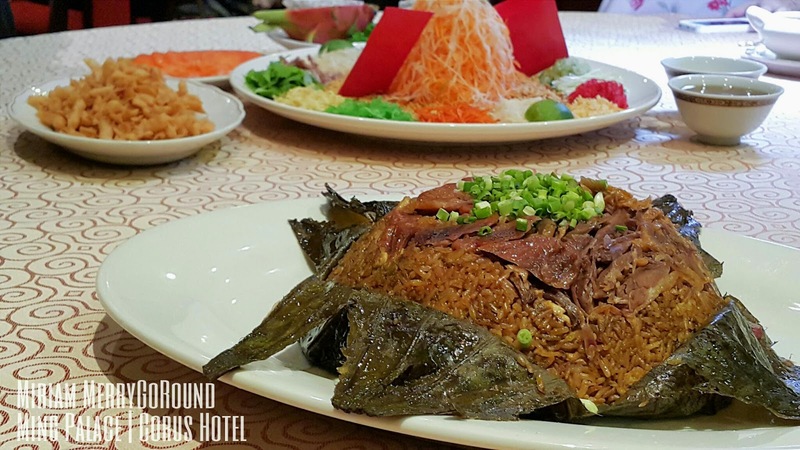 To usher in the Year of the Goat, each dish has been crafted by the team at Ming Palace with creative dishes lead by Chef Ng Chee Wah. 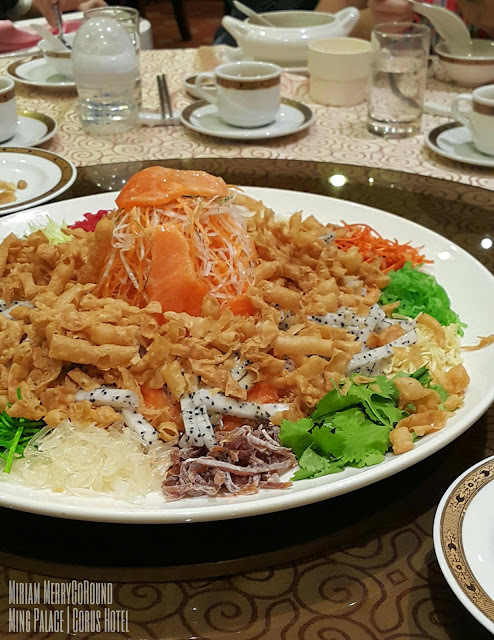 The first dish to start off the dinner is the must have Yee Sang. 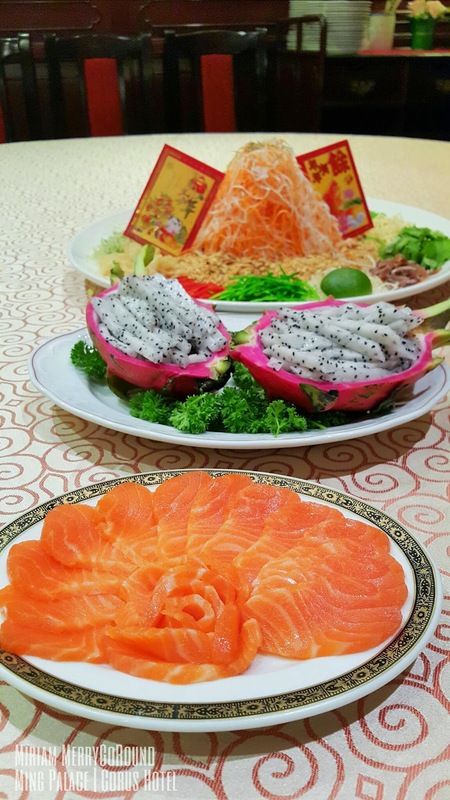 You will be able to enjoy Ming Palace Salmon Yee Sang with Dragon Fruit and Pine Seeds (RM 128++). The best part of Chinese New Year is gathering with friends and family and 'Lou Sang'. Besides that, Ming Palace is also offering special Auspicious Chinese New Year menus to cater to each person. There are two different 7 course meal sets available for minimum of four pax priced at RM 118++ and RM 158+++ per person. The highlights for these 7-course menu is their Prosperous Salmon Yee Sang with Korean Pear, Double Boiled Chicken soup with dried Scallop and Cordycep Flower, Steamed Silver Pomfret in Premium Soya Sauce, Braised Sea cucumber with Dried Oyster and Fatt Choy, Fried Rice with Waxed Duck and Liver Sausage in Lotus Leaves and ending with their Sweetened Pear, White Fungus with Red Dates and Lotus Seed. 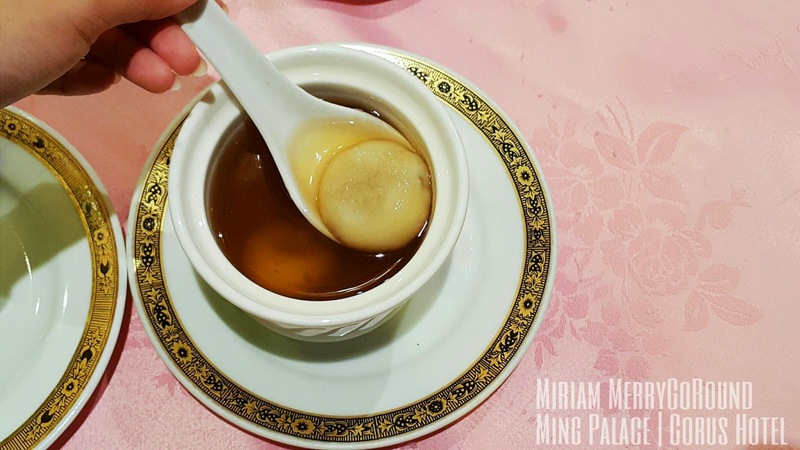 Instead of the usual shark fin soup that is served at Chinese dinners, Ming Palace served the Double Boiled Cordycep Chicken Soup with Fish Maw and Dried Scallop. Served in individual bowls, this soup is full or flavour at each sip. The flavours from the ingredients were well extracted into the soup and you could get all the goodness from each ingredients in the soup. The ingredients used are also very nourishing and beneficial to both old and young this new year. 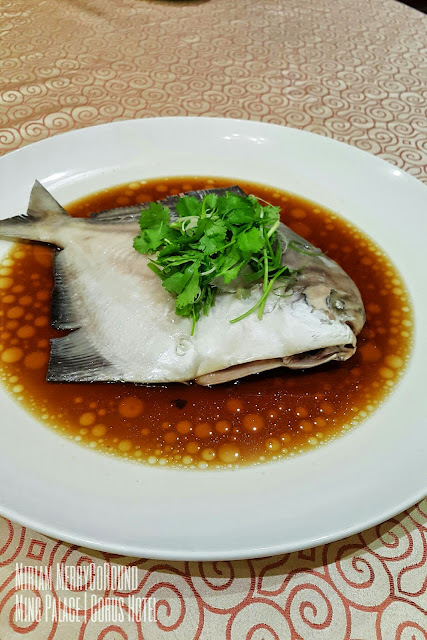 Another dish that is a must at every reunion dinner is fish as in Chinese it represents to usher in more and more gains in the Year. You will be able to enjoy the Steamed Silver Pomfret with Soy Sauce which is served really fresh and sweet bathe in premium soy sauce. This simple way of cooking this dish was able to bring out the natural sweetness of the fish and keeping it traditional and authentic. Cooked really well the fish was still tender and full of flavour. 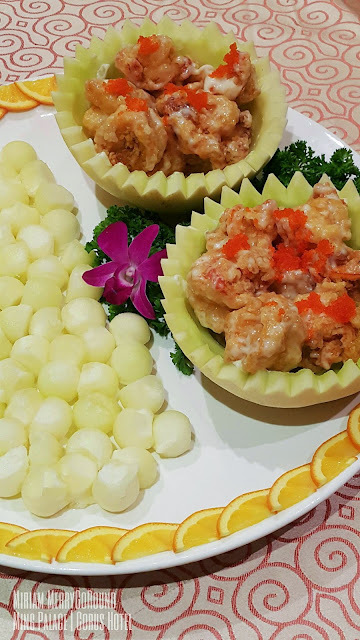 To continue with the next dish is also another auspicious dish of Stir Fried Sea Prawns in Honey Dew Boat. The sea prawns were well battered and fried crispy, coated well with a creamy buttery sauce and served with sweet juicy honeydew balls. 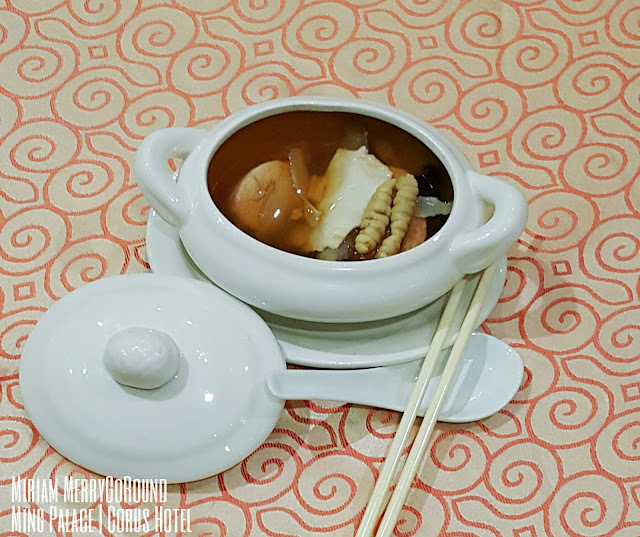 The honeydew flesh were scooped up into round balls and the stir fried prawns were served in the honeydew boat. The prawns were really juicy and tender and the honey dew gave it a nice sweet balance. 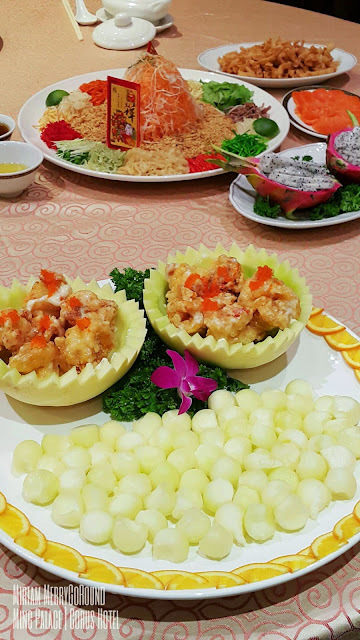 The honeydew balls were really sweet and complemented the prawns really well. 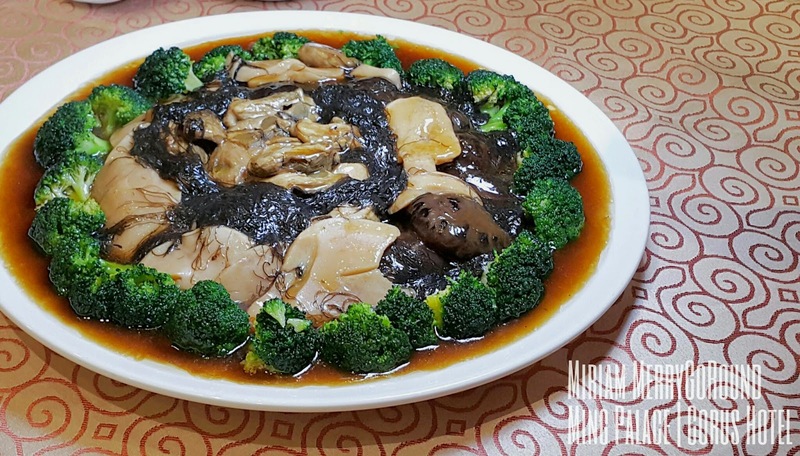 Another dish to usher in the new year is the prosperous Braised Top Shell, Sea Cucumber with Dried Oysters and Fatt Choy. 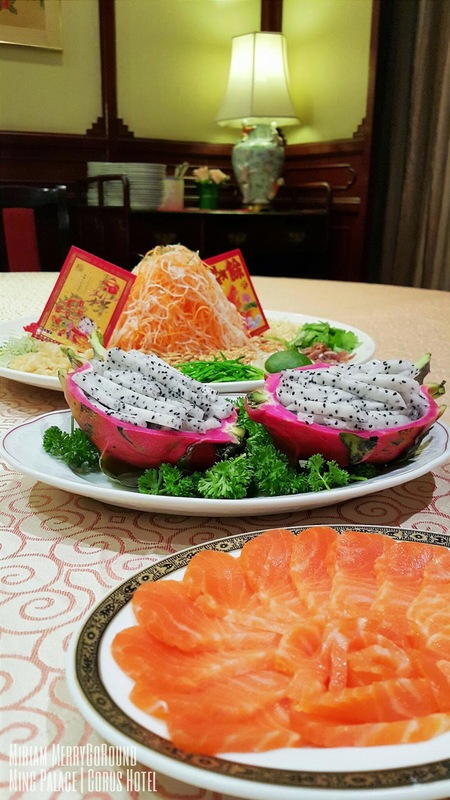 This dish full of rich and prosperous ingredients is definitely a dish to be eaten this Chinese New Year. Each bite is full of flavours from the sea and is well prepared by the team at Ming Palace. Following the dish is a comfort dish served at nearly every household which is the Stewed Chicken with Chinese Herbs. 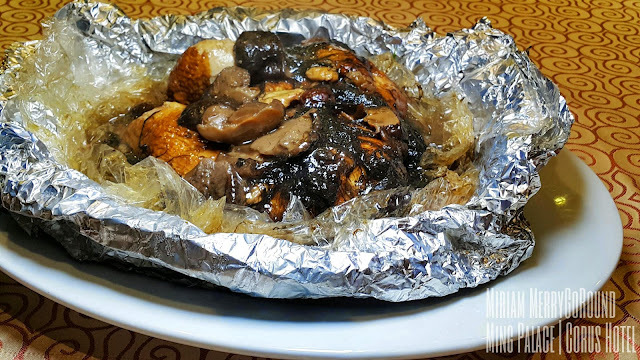 This dish is prepared in a wrapped aluminum foil sealing all the flavours in before being served on the table. The chicken which is tender and we'll prepared had a rich flavour from the Chinese Herbs. 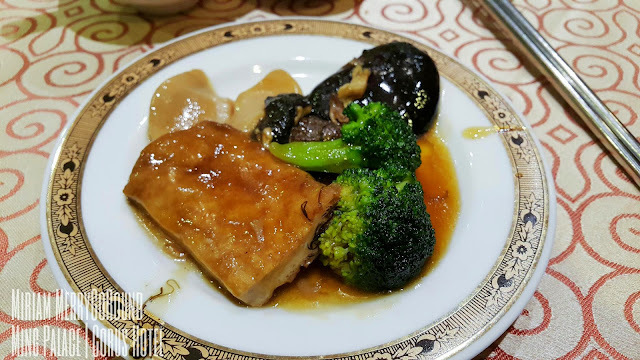 Although some may not be able to enjoy strong herb flavours but I am sure that the elders would enjoy this traditional dish well seasoned with Chinese herbs. Another dish also wrapped in foil is the Fried Rice with Waxed Duck and Liver Sausage in Lotus Leaves which was well served. The lotus leaf when opened up like a star really showcase the dish very well. However, this dish was not able to capture my heart like the rest of the dish. It fell short of my expectation as it was rather dry and the flavours from the Waxed Duck and Liver sausages have not been fully absorbed into the rice. 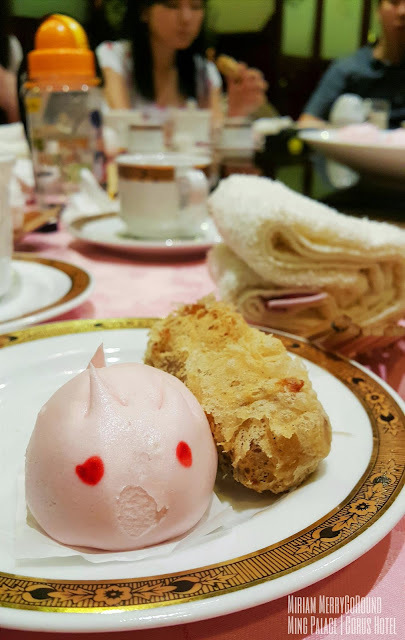 To finish off the meal on a sweet note is the Duet Sweet Dainties (Fried Ninko and Rabbit Bun) paired with Ginger Tea Glutinous Rice Dumpling. The fried Ninko was crispy and the Ninko remained sticky and chewy. I am a huge fan of Ninko and this dish paired with super adorable bunny buns captured my heart. The Ginger Tea was fiery and you can feel the heat from the ginger down your chest. Fans of ginger tea would absolutely love this dish as the glutinous rice dumpling fulled with black sesame was a sweet dessert to end the night. If you have a larger group, you can opt for their 9-course meal which ranges from RM 888++ to RM, 788++ per table of ten pax. This package includes a complimentary bottle of red wine or chilled orange juice and you can get a 38% discount on a second table of ten pax.